Symptom Checker: Is Your IT Management Workload Being Mismanaged? Symptom Checker: Is Your IT Management Workload Being Mismanaged? Symptom Checker: Is Your IT Management Workload Being Mismanaged? Mismanagement of IT workloads is the invisible menace that may be holding your IT department back. 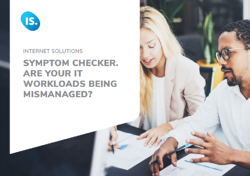 Our IT Workload Symptom Checker is available to shed some light on what may be causing the problems, and help you find a way to rectify it.